It’s a common practice these days for brands to run customers appreciation events and campaigns, such as loyalty programs, unexpected upgrades, special treats and customer spotlights. That gave me an idea for a series of posts to show my appreciation to some of my favorite brands. Atelier Cologne holds a special place both in my heart and in my collection: this is one of a few niche brands that I discovered on my own, without reading anything about it on one of the perfume blogs first. In 2010, a year after the brand was created, while I was browsing around the perfume department of Neiman Marcus, a sales associate spotted my patiently waiting vSO and suggested him to try cologne from a new line they’d just got in the store – Atelier Cologne. I rushed to the rescue but it was too late: he liked it. I knew nothing about the brand – so instead of just dragging him to the safety of shoe department and explaining why “we” don’t buy this one I had to stop and check it out. Surprisingly, I liked it too. But I liked even more another one from the line. “Liked” as in “wanted my vSO to wear it.” He, in his turn, liked it too but not as much as his original pick. We would have probably left the store with a new bottle but we couldn’t agree on the choice. But the SA could tell we were almost hooked, so two samples went home with us – Bois Blonds and Trèfle Pur – and I can’t remember any longer which one was my favorite. Given time to test perfume without any pressure, we often realize that the initial infatuation was just that. And we feel relieved that we didn’t give in to the impulse buy. It wasn’t the case with Atelier Cologne’s perfumes. Within a month we were back to the store. We still couldn’t agree on which one was better so we bought both. And since then Oolang Infini, Orange Sanguine and Santal Carmin bottles as well as several decants have joined the first two. Even though I like many of Atelier Cologne’s perfumes and consider them truly unisex, I rarely wear them myself: somehow in my mind they are my vSO’s perfumes. But since he likes them and his collection is much smaller than mine, I get to enjoy these perfumes probably more often than my own favorites. While making great perfumes is important – and, in my opinion, Atelier Cologne succeeds in this area, what makes me appreciate the brand even more is their approach to business. For years many perfume enthusiasts, including me, have been constantly complaining about lack of bottle size variety. At some point with all those 100-ml-bottles-only offerings from niche brands we were almost tricked into thinking that a 50 ml bottle was a gift. Atelier Cologne from the beginning offered two sizes – a 30 ml bottle for those of us who likes variety and 200 ml bottle for those who are ready to go steady with a favorite scent. Both bottles have a very nicely proportional shape and everything else in packaging is done with the highest degree attention to details – just as any luxury item should be. Later Atelier Cologne introduced a 100 ml bottle. Then they had different collections of 7 x 7.5 ml travel sprays, miniature discovery set of 5 x 5 ml splash bottles, and many other options – just look under Gift Boxes on their site. And you can buy any samples – a set of 24 x 2ml samples for $30 or individual samples for $3 each (both including S&H). There is just no good reason not to try their perfumes. Also in the U.S. (I don’t know if there is anything like that in Europe – please share in comments if you know) Sephora offers many of the perfumes from the line as individual 7.5 ml sprays, 2, 4 or 7 bottles sets – some of them spray, some splash and many other combinations. I really appreciate that Atelier Cologne chose to be accessible and to promote good perfumes to wider audience. I’m glad they didn’t stay high-end department stores exclusive. And I like that they chose such a model in which I do not have to commit to using one – even the most great – perfume for the next couple of years. That’s why I – and obviously many other loyal customers – have voted for Atelier Cologne to receive The Start-Up of the Year, EY award (and they did!). No matter where you live, you have a chance to win $200 participating in their contest #MomentInABottle (see on FB or on Instagram). 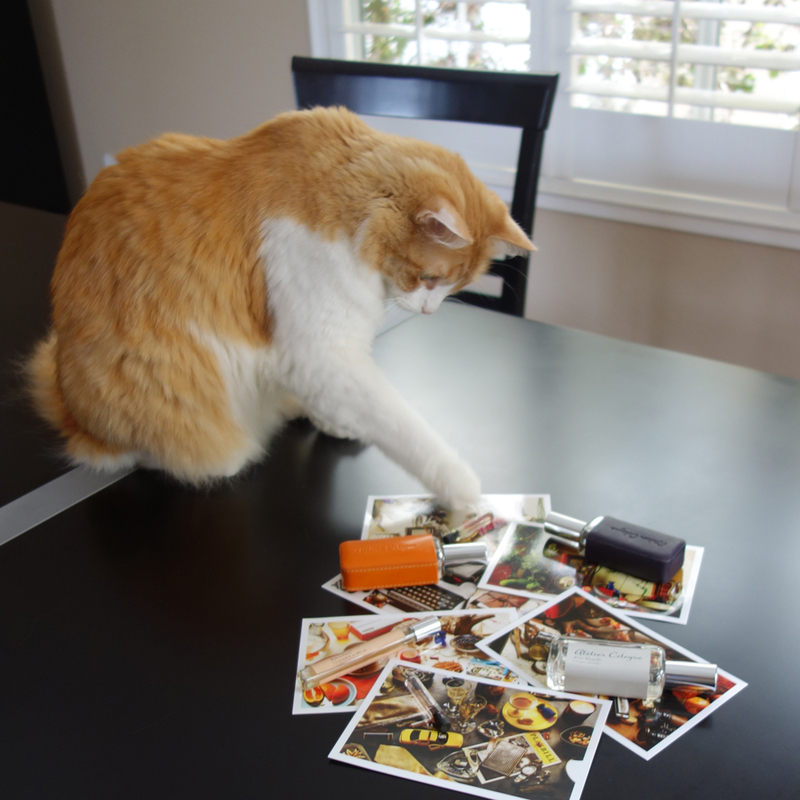 The moment I chose: Rusty “helping” me to make the best possible composition for the photo of my favorite perfumes. This entry was posted in "Four legs good", Favorite Perfumes and tagged #MomentInABottle, Atelier Cologne, Bois Blonds, Oolang Infini, Orange Sanguine, Santal Carmin, Trefle Pur. Bookmark the permalink. I love the phrase ‘ready to go steady’ with a favourite scent, haha! I had no idea that Atelier offered quite as many different sizes and formats as it does but I’m very impressed now I know. For me the aspect of the brand that always reeled me in was the way they conjured up the perfumes via ‘mood boards’ in those postcards (that I see Rusty is organising in the photo). They really do transport you to a particular setting and add a little bit of magic to proceedings. I do have to say that I find the shape of the bigger bottles a bit dull, but knowing that there are these smaller formats gets over that problem. I like those postcards too! They are like a fantasy world where some things are (or feel) retro and some are modern. 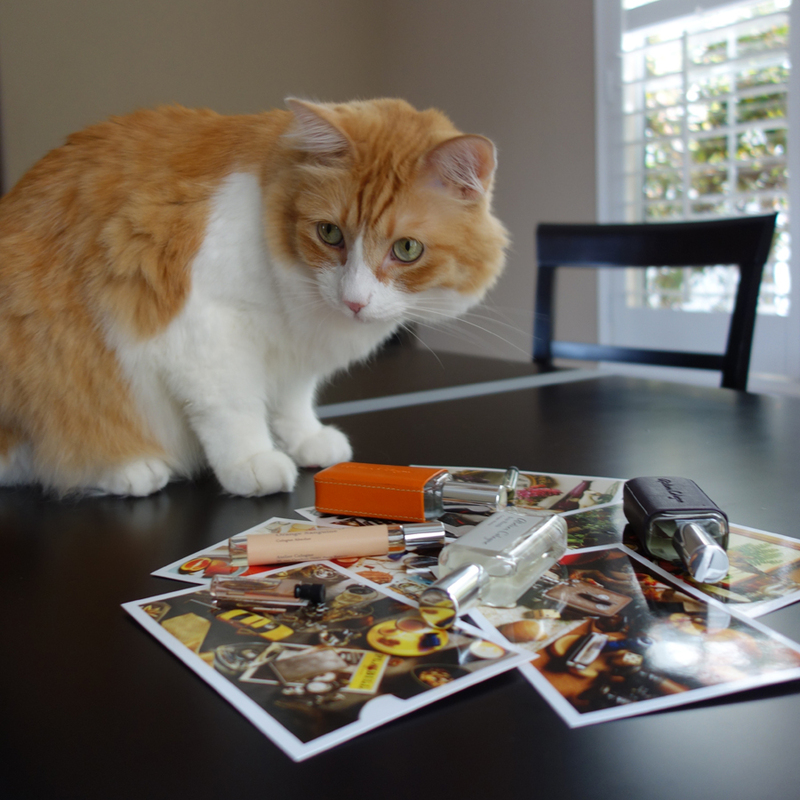 But I have to mention that Rusty was more interested in a sample vial that isn’t too visible on that background (at least for a human eye on the picture; Rusty had absolutely no problem finding it). I decided to enter just because I happened to have a perfectly square picture that I made for this post. I don’t think it’ll win but why not to share it with others? Thank you, Steve (from both of us :) ). One of the bottles on my short “to buy” list is Oud Saphir: with my feelings about agarwood I was doubtful about this one, but we tried it recently and it was amazing on my vSO. So I clearly see a bottle of it in his future. How funny that you get to enjoy Atelier Colognes frags more than your own favourites thanks to your v.SO. Like V, I had no idea about all those bottle options and agree the “mood boards” are very attractive. I also didn’t know they were now accessible in stores like Sephora – not that we have many (any?) of those over here. I appreciate how they interact with their customers and I won Trefle Pur via a FB comp a few years back. Fingers crossed you win this one! Hello dear, it’s been a while since our last meeting. Seems like both of us are rather busy with less time to spend blogging. For me Atelier Cologne was the first niche perfume brand that I started exploring. I first read about the brand on NST and then found a niche boutique in Poznań where I studied and they had the brand. Grand neroli was my favorite one then. Now I have quite a lot of those Colognes Absolues in my collection and I enjoy wearing every single one of them. I totally agree that AC is one of those customer friendly brands. 30 ml is a great size and that bottle looks so cute, especially when you put it into one of those colorful leather cases. Perfect for traveling. And those 7,5 ml “rods” are great to discover the scent if 2 ml sample is not enough for you. Lucas, one day I’ll tell you how busy I am these days :) I promise that I still read all your posts. I just don’t have time to stop and comment. In addition to the bottles that I named above, I have several decants and they have a good chance becoming a bottle once I/we are done with them. I love this post, Undina! Like Lucas, I first read about Atelier Cologne on NST and I don’t recall if it was Rose Anonyme or Sous le toit de Paris. With Sous le toit de Paris having limited distribution, I had been plotting to get to the Elizabeth Street boutique for a while. In January 2013, I had made plans to meet up with a friend for dinner at Daniel Boulud’s DBGB Kitchen and noted that the boutique was within walking distance of the restaurant. And so an Atelier Cologne fan-girl was born :-). I, too, agree that the 30 mL size is perfect and in fact, I’ve brought them on vacation as my staple perfume for most of my vacations in the past 2.5 years. Ah, and our dear Rusty makes an appearance. He’s beginning to look fluffier again. In the first picture, it looks like he was caught doing something naughty. It’s funny: I was always under the impression that everybody else knew about niche brands long before I learned about them. I need to try Sous le toit de Paris again: somehow I cannot remember what I thought when I wore it the last time. Lovely post, Undina. I like Rusty mischievous look on THE first photograph, reminding me of my cat Rubio. We do not have Sephora here anymore, in THE Netherlands, but A-C is sold nearby and I believe they sell in THE shop, 200 mls and 30 mls bottles mainly. I agree with you, offering all these sizes is very customer friendly. The 30 mls bottles are very handy for travelling, I have Grand Neroli, one of my favorite neroli fragrances in a leather pouch. Love your orange one ! Have Some scented candles as well of Trefle Pur which is great during summer. I have one more pouch – purple, I just forgot about it when I was taking the picture. They look very nice and I feel like a bottle is very well protected for the travel purposes. I haven’t tried their other products yet but I plan to soon. Hi Undina! It looks like Rusty is making a thoughtfully considered choice in your photo. I hope you’ll win with that one! I agree with you, a big reason I like Atelier Cologne is the variety of bottle sizes. I always like 30 ml bottles as a good starter size (whenever I go through one of my 30 ml Jo Malone bottles, I know I can commit to a 100 ml bottle of the same scent). And I appreciate mini discovery set type things, they make great gifts as well. I’m glad your vSO became a fan of this brand, and that you get to enjoy it too! Thank you, Caitlin. I don’t think this picture will win (there are many really great pictures in there) but I decided to participate just to participate. Undina, you are so good at telling a story! I really enjoyed hearing how this brand appreciation for Atelier came about, and it speaks highly for their fragrances that you came to love them without ever reading a thing about them. Lastly, a big yay to the 30-ml bottles! That was a very smart move on their part. Dear Suzanne, thank you for the kind words you always have for my writing: they are extremely supportive and encouraging. I appreciate it very much. I hope more brands will follow suit with reasonable bottle sizes. This is one of my favourite brands, I like the 30 ml bottles, so perfect for travel and enough to be able to wear the scent often (on my second 30 ml Orange Sanguine now, so perhaps I should have bought the bigger size). I also own Sous le toit de Paris and that one is very good, too (but then I again I am a fan of green scents). I got to know the brand by ordering their sample set, but since then they have a much larger range of scents. I would love to hear your impression of several of the newer scents. The pouch looks so stylish, I am thinking of getting one, but last time I gave priority to getting a second bottle of perfume. It really is a good brand for introducing people to high quality scents, the style is so uncluttered, if that makes sense. Usually when we travel I take small decants for both my vSO and myself. But just now I realized that whenever we take Atelier Cologne’s perfumes, those 30 ml bottles in their pouches feel to be of the perfect size and safe to travel. From the newer perfumes, I like Rose Anonyme, Vétiver Fatal and Figuier Ardent. And I loved Oud Saphir on my vSO. Now I’m very curious to try their latest – Jasmin Angélique. On more than one occasion I said that I would prefer to pay more per ml for a real brand bottle in a smaller size than a plain glass decant I can get from splits so I wish brands started producing those. I look at my collection and I do not think I need more than 30 ml of most of them, even those I like a lot. I do love the 30ml bottles and to be honest that’s the only format I’ve purchased them in and I love the leather case and they’re easy to take travelling . At Sephora in France occasionally they have a set with minis available too. And sometimes I’ve found them on sale at Galleries Lafayette and that prompted a purchase. Good luck for the competition. Apparently they’re highly successful in their turnover as well. Every time I hear about perfume sales at B&M stores in Europe I feel jealous: it never happens in the U.S. I don’t count much on winning in the competition, but there was no reason not to enter since I already had Rusty to pose for my other purposes. That’s a nice description of what happens to men in the perfume section! The unwary get tagged, luckily in your Vso’s case it was with something good! I agree with your point about Atelier’s sensible business with the varied bottle sizes. I’ve never bought any but wonder why not? Rose Anonyme was a favorite of mine when it came out and Trefle Pur another. They really are a very good brand. So why does everybody buy EL instead? I think that “Cologne” part might play against them: mass market customers consider colognes to be something for men. Also, EL’s unique bottles for each perfume might appeal more to the older generation and Marc Jacob’s plastic flowers/bugs/etc. are a more intuitive choice for a younger generation. But hopefully Sephora will promote the brand enough to gain some following from all alphabet generations. A bit late to jump in because of the travelling. ;) I LOVE Atelier Cologne, especially in their 30ml bottle with those colourful leather cases. Unfortunately in the area I live in Spain, I haven’t seen any AC for sale anywhere… Have you tried any of their soaps yet? I hugely recommend them, they are big and smells gorgeous. I haven’t tried any of their soaps yet but just because I’m still on my previous soap: for some reason my soaps last forever. But I will buy one of their soaps soon. Unfortunately all those lovely bottles options are unavailable here, or I would own several already. Figuier Ardent especially is a winner in my books, but vetiver fatal and a few others a just great perfumes too, especially in the ‘everyday -wear’ category. I’m glad I just saw your answer to the magpie, because these days it seems to take me forever to write anything; an email, a post, a post answer etc… But it has been on my mind wanting to post ana nswer to this post for a while. I know exactly how you feel! It seems like I’m running behind on every single aspect of my life these days (BTW, I will come to your blog soon :) ). On more than a couple of occasions I remember thinking that some brands should have trusted somebody else in coming up with the bottle design. Especially when it comes to brands that position themselves as luxury ones. But even with not that expensive indie brands I feel like I can’t completely trust those brands who cannot do a decent job with the bottles and labels: those do not have to be extraordinary – just decent. Otherwise, I keep thinking: what else have they skimped on? I’m glad to hear that I’m not alone regarding both the answering emails aspect as well as the design view. I suppose we all like different things, evenso I can’t think that many people would dislike the Atelier Cologne tambleau postcards. Perhaps it comes down to niche perfume brands having a creative director/ perfume who decides everything, which mostly is perhaps not the best way to get great design? We are Atelier fans in my house as well…all the samples from the sample set, various mini splashes, two 1oz in monogrammed leather cases (Orange Sanguine and Vanille Insensee) and the 200 ml of Orange Sanguine which has been decanted for gifts over the past year as well as used by all …it has about 1/4 of the juice left. The soaps are amazing as well…last summer the bar lasted the entire summer! Since I wrote this post, I’ve added one more bottle from this brand – so it looks like I’m still a fan. Oh, and it seems it was some type of a glitch when around New Year they suddenly had prices going up for their regular collection. It looks like now they are back to the “normal” prices. I plan to get soap from them soon as well.